Currently the settings for the Bible Research group allow anyone to join without prior approval from the moderators. However, posts from new members will be held back temporarily for moderator approval to prevent inappropriate messages from being sent to the list membership. After a few sensible posts new members will be allowed to post unmoderated. The purpose of the forum is to provide a place for discussion of the canon, text, translation and interpretation of the Bible. Please do not stray too far into subjects which are off these topics. This is a forum for conservative Christians. Posters may not use the forum to challenge the authority and inspiration of the Bible, or to propogate doctrines that are contrary to the historic Christian faith, as summarized in the Ecumenical Creeds. Posters should not attack the character of other persons, especially of forum members. Accusations of dishonesty should not be made at all without proof. Please avoid attributing ulterior motives to people as explanations for their viewpoints. Posters should back up any controversial assertions of fact with suitable references to reliable sources. People who advocate the exclusive use of the King James Version or the Textus Receptus are not welcome on this board, especially if they characterize all other versions as perverted, heretical, etc. Anonymous posting and the use of assumed names is not allowed. All messages should be signed with the real name of the poster. The moderators may not be the subject of a message which criticizes their decisions and standards when moderating messages on this forum. Any complaints must be registered off-list, with the appropriate moderator or the list-owner. Please do not send a long article in a message to the group when the article can be accessed on the web. It is better to post a link to the article. When joining the forum, consider sending a post to introduce yourself and a little about your background. It will help people understand you better. Write appropriate subject lines. When replying to a post, check whether the subject line still describes the topic you're addressing, and change it if necessary. Remember the other people in the forum are real people! Please speak the truth in love. DISCUSSION AND DEBATE had at one time a much larger role in the education of students than it has now. 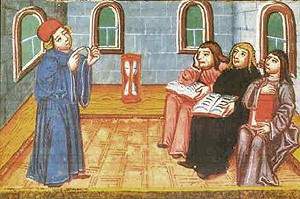 In medieval times the formal disputatio (disputation) was an exercise required of candidates for the master's degree, and it was the academic equivalent of today's master's thesis. Disputations were normally presided over by a faculty member who arranged for one or more students to defend a series of theses (propositions) against the criticism of opponents. Objections were usually presented by other masters and sometimes by students who were present. The respondent answered the arguments raised, and when necessary, the master lent him assistance. These medieval disputations were usually orderly and courteous, but often very lively. Disputatio with hour-glass, circa 1500.